This Nor-Vise innovation makes it easy to create an endless variety of dubbing brushes with oriented feathers, fur or hair spun between two wires. 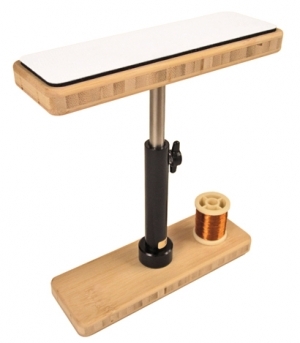 Now adjustable for height, the Nor-Vise Dubbing Brush Table has a special cushioned fabric-inlayed bamboo surface and non skid base. Included are instructions and a generous supply of copper wire.